When EtlTool is defined, then it runs through out a DOS-like window. All lines read and all inserts into postgreSQL or MySQL will quickly appear on this window. The first time EtlTool runs, the window freezes. 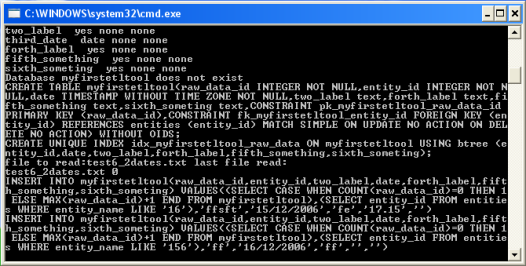 In Benetl the EtlTool tells when it has finished its job with a datasource file. You can stop the window and relanch the EtlTool.bat file created into the datasource folder. you can set in Benetl the level of debug message you would like to have. You just have to add 0 or 1 or 2 as a second argument in EtlTool.bat file.